Give us your favorite photographs and we’ll create a pictorial memorial of your loved one that will last many lifetimes. 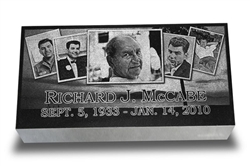 Our laser engraved headstones are the perfect way to personalize a memorial tribute to your departed family member. We can take any good quality photograph from an actual hard copy to a digital image and incorporate it into the headstone design giving anyone a chance to see what your loved one looked like. 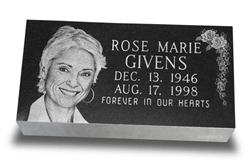 These laser engraved headstones are made to your specifications and ship free within the 48 contiguous states. When you submit a photograph to us, our designer scans them into a computer and incorporates them into a design with your choice of lettering and dates. You will be sent a layout proof giving you the opportunity to view the memorial before it is engraved by the laser. The final approved layout is then converted to a format which the laser machine can read. Within minutes the laser burns the surface of the granite permanently changing areas of the black granite color to a light gray which contrasts nicely with the black recreating the photograph. The finished laser engraved headstone is then crated and shipped to the cemetery for installation. Why A Laser Engraved Headstone? When it comes to memorializing a loved one, people always gravitate toward options that allow them to personalize their beloved's headstone. One particularly popular area of personalization is having the likeness of your loved one on the headstone. Having their photo brings you much closer to their memory as you visit their graveside. Traditionally a person had to purchase a ceramic oval picture to attach to the headstone to achieve this kind of personalization. Thanks to modern technology we are now able to utilize a laser to engrave a photograph onto a highly polished black granite headstone. There are limitless design options with this method and the end result is a very impressive likeness of your beloved family member. Since we own the laser engraving equipment, we control all levels of production and quality. You will have a direct link to the manufacturer (that's us) and not be dealing with a middle man with these laser engraved headstones. We use only the best quality granite and talented designers to help you achieve a beautiful memorial tribute. Having control of all aspects gives us the ability to market these wonderful memorials for an affordable price. The end result is a quality memorial headstone you can afford and that translates to a value you cannot pass up.